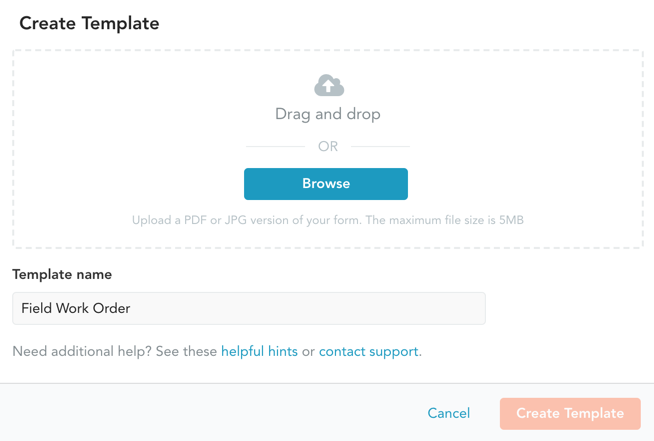 GoFormz makes it easy to convert your paper forms into electronic forms. In this article, we go over how to create a new template from a paper form. The we will link you to additional articles that go over how to build out your template by adding digital fields and setting their properties. 2. Click the Create Template button in the upper right corner to launch the Create Template dialog box. 3. Enter the template’s name in the Name field. In the example below, the name is “Field Work Order”. 4. Drag your PDF or JPG file into the dialog or click Browse and select your file from the file chooser that pops up. 5. Click the Create Template button to upload your file and open your new template in the Template Editor.